This fifth Newsletter includes our second annual checklist of publications on Blake. The checklist depends a great deal on readers who send in information about articles, and on authors who send offprints. The more such assistance we can get, the more comprehensive and useful the checklist will be. This Newsletter also presents our first book review. Originally it had seemed unnecessary to review books, but it’s gradually become clear that reviews addressed to Blake scholars could perform a function not otherwise performed. We intend to be selective about books chosen for review; suggestions from readers are welcome. (The new Blake Concordance will be reviewed in our next issue). Many Newsletter subscriptions expired with #4. It would be burdensome to bill readers individually. The number after your name on the address label indicates with what issue your subscription expires (or expired). In the event that your records don’t agree with ours, we will resolve the difference in your favor, but please let us know about this. I expect to be away from Berkeley for at least the first half of this summer. Experience shows that forwarding mail produces more difficulty than anything else; therefore it will be held for me at Berkeley, and Newsletter correspondence will be even more dilatory than usual for the next six weeks. 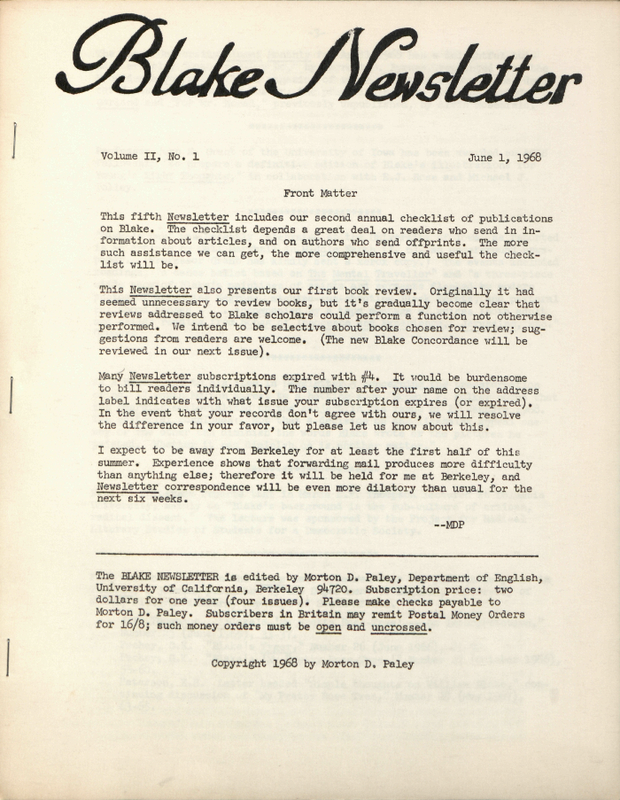 The BLAKE NEWSLETTER is edited by Morton D. Paley, Department of English, University of California, Berkeley 94720. Subscription price: two dollars for one year (four issues). Please make checks payable to Morton D. Paley. Subscribers in Britain may remit Postal Money Orders for 16/8; such money orders must be open and uncrossed.